The last five platforms, numbered 1 to 5, at London Bridge station, opened this morning. It is now possible to judge the station as a whole. In my experience, the layout of the spacious concourse is unique in all the stations I have visited. And I’ve visited quite a few! And not just in the UK, but all over Europe. Effectively, it is like a city square, with separate stations on viaducts above. The one-platform station (Platform 1) for trains from Cannon Street to SE London and Kent. The two-platform island station (Platforms 2 and 3) for trains from SE London and Kent to Cannon Street. The two-platform island station (Platform 8 and 9) for trains from Waterloo East to SE London, Kent and Sussex to Charing-Cross and Waterloo. The six-platform terminal station (Platforms 10-15) for trains to SE London, Surrey And Sussex. 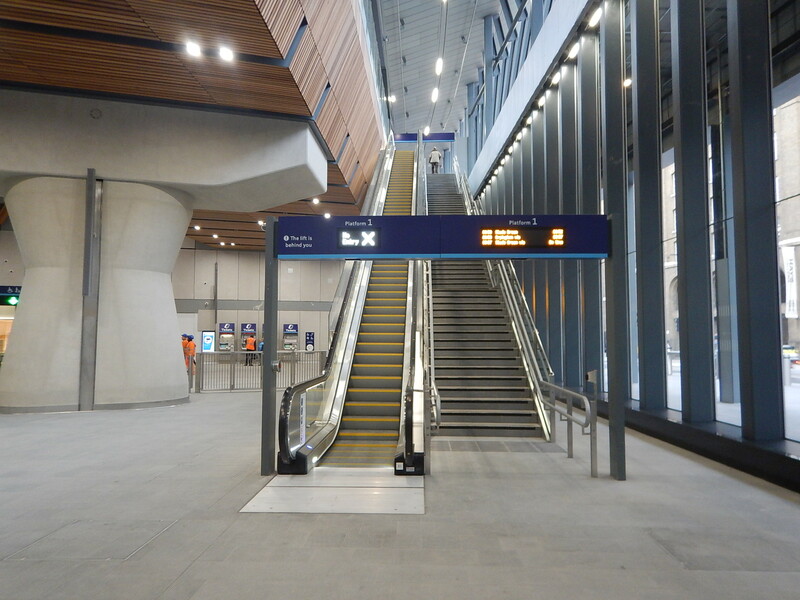 All platforms have two or more escalators, stairs and a lift to and from the spacious concourse. The circulation space is uncluttered with just one fast food outlet discretely to one side. Others will be slotted in. The lighting is excellent, with lots of natural light. 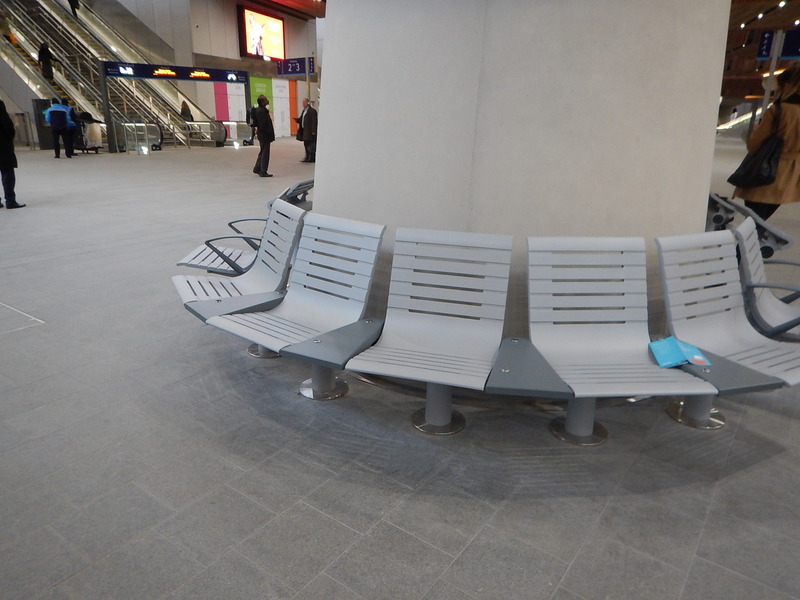 Many stations are dingy, despite having been built or rebuilt in the last few years. Ticketing and security is ensured by several lines of ticket gates, leading to a surrounding unticketed concourse. 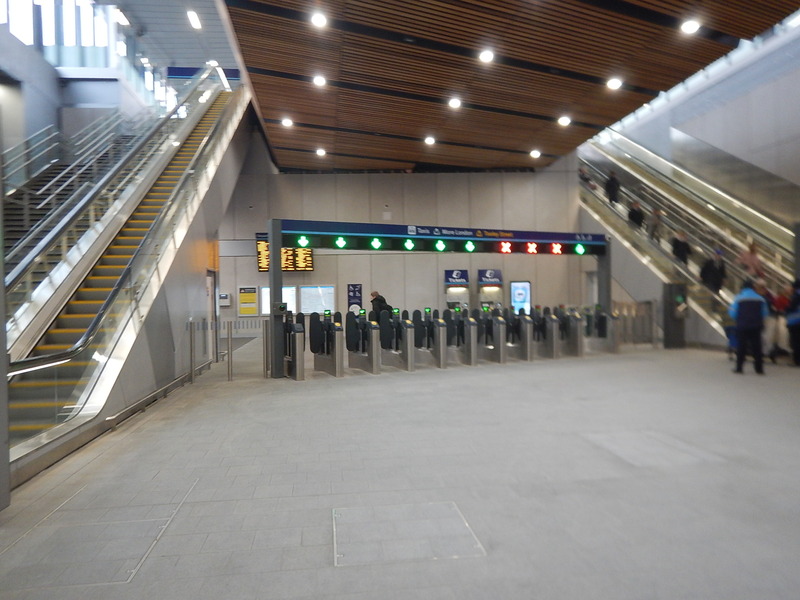 |Effectively, London Bridge station has two concourses. The ticketed concourse, that connects to all the platforms and the trains. There is also a second concourse surrounding the ticketed concourse. This second concourse extends through the station from Tooley Street to St. Thomas Street. The streets outside the station are effectively parts of the second concourse. Level walking routes to the Underground, the River, Guys Hospital and London Bridge are provided. A separate escalator connection links to the bus station, from the second concourse. There are more shops and a ticket office. Where else could this concept be employed? The obvious example is surely Manchester Piccadilly station, where there will effectively be three stations. A terminal station for trains going to and from the South. A two-platform through station capable of handling sixteen trains per hour, replacing the dreaded Platforms 13 and 14. All would be linked by a huge London Bridge-sized area under the tracks, with both a ticketed and unticketed area. The tram station would be at the same level as the concourse, accessible from the unticketed area. Shops would be mainly in the unticketed area, with a minimum in the ticketed area. A clutter-free design is needed. The aim would be to ensure that quick and easy interchange between various transport modes was created. The concept would also work at a rebuilt Euston and should probably have been used instead of the very passenger and staff-unfriendly design at St. Pancras, where interchange between separate services is not for those that are not 100% fit. I also think that a similar concept of a split concourse, with ticketed and unticketed areas could be applied at a traditional terminal station like Brighton, Liverpool Street, Liverpool Lime Street or Waterloo, where significant numbers of passengers interchange between services at the station. A second ticketed concourse could be created between the gate line and the actual platforms. The concourse outside the ticket gates should be extended into the surrounding streets, as it effectively has been at Kings Cross. A lot of decluttering should go on. Hopefully, as each new station is designed, the concept will be improved. Can platforms be too wide? Probably only accountants can answer that question. But we certainly need more island platforms! They make it so easy for passengers to reverse direction, without going up onto a bridge or down into a subway. 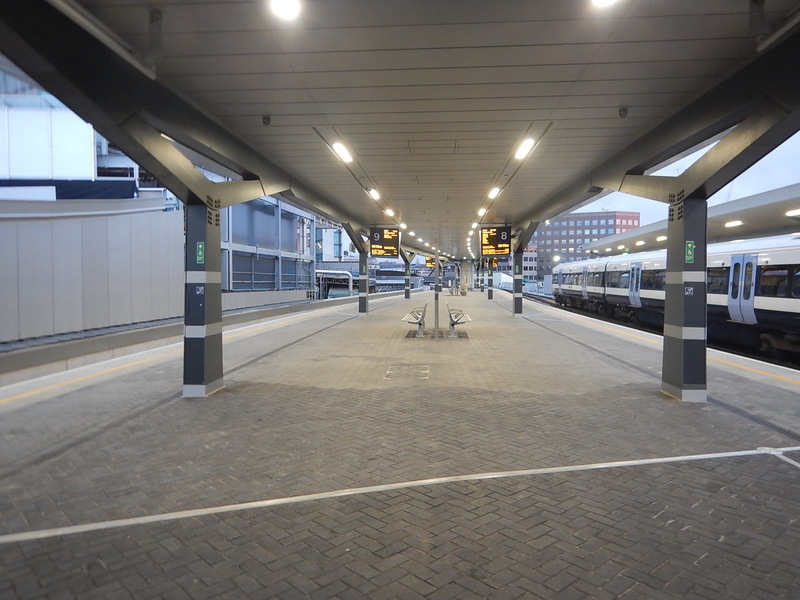 If say you were going between Bedford and Cambridge on Thameslink, perhaps with a heavy case or in a wheel-chair, it might be easier to go as far South as London Bridge station, where you could just cross the platform for the second train. Unfortunately, no-one thought to build the important Thameslink station at St. Pancras with an island platform. The lights on some of London’s ticket gates are difficult to see, as you approach, but these are so much better. Surely, as people will line up a few metres away and walk straight towards the gate, this might increase passenger throughput. Can we have more of this please? This is good, but it could be better. Imagine a one-line display on top of the main display, which could be used for title, important or emergency information. RMT Call Off Strike Tomorrow! The standard display for the various platforms at London Bridge could be. There are no ticket machines in the ticketed area. In Germany, there is often a ticket machine after you have passed the gate. I find it very useful, as they can be used to buy tickets for a later journey or look up future connections. 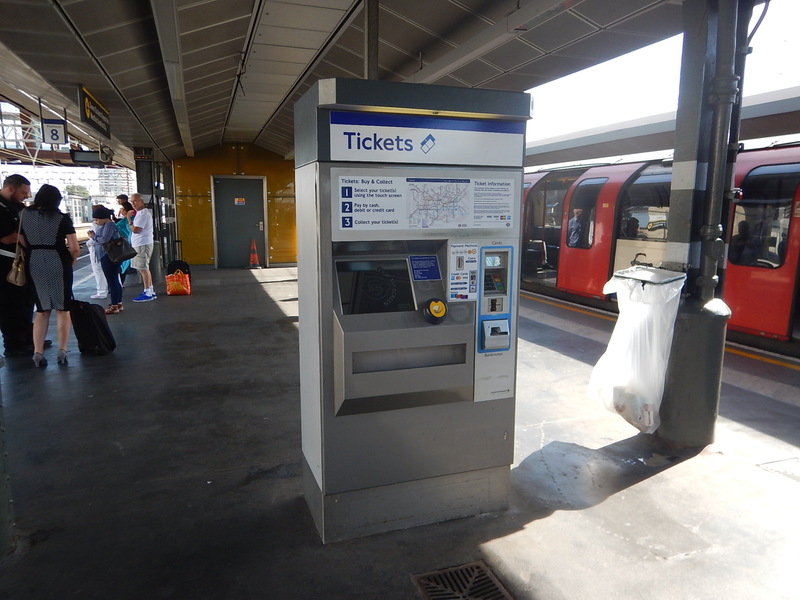 I only know of one ticket machine inside the ticketed area in the UK and that is on Platform 8 at Stratford station. We need more of these! The need will get more urgent after Crossrail and Thameslink are fully open. Suppose you are doing a journey from somewhere in the Oyster/contactless card area like Ealing Broadway or Ilford to perhaps Hastings, Ipswich or Oxford, which are not. You might not be starting your journey at a station with a ticket office. Because you never go outside the Oyster/contactless card area, you haven’t bought a ticket in some time. You might like me be a Freedom Pass holder. So you might arrive at London Bridge or Stratford, without a valid ticket for the rest of your journey. Currently, at London Bridge station, you have to go outside the ticketed area to get your onward ticket. A ticket machine or machines inside the ticketed area would be better. Perhaps, like cash machines, ticket machines might be provided by third-party operators? Time will tell! But I think more will be added! Watching the station for the last 5 years of its redevelopment, I am actually pretty impressed with the end result. It is a very unconventional layout for a UK station as you rightly point out, but signs are promising it will handle the peak loads for a few decades. The look reminds me a lot of the new Vienna Hauptbahnhof, although that build was started after , and completed before London Bridge (although didn’t have to contend with trains running through it throughout the works as they did at LB). I think they’ve been pretty liberal with the space, which certainly helps. I’ll be going through Berlin HBf tomorrow and that is cramped by comparison. And it was built recently!